A couple of the Texas Ad Grad ladies were in town this weekend and we watched Texas kill UCF, always a good time, then we went to the de Young museum to see the king tut exhibit. I have heard mixed reviews but I really enjoyed it, there were a few too many people there for me . . . but not a big deal. It is now believed that KT died of an infection from a broken leg instead of a blow to the back of the head. They don't know who his parents are, and the ones that they assume are his parents also birthed his future wife (duurty). The pyramids had been built for around 1,000 years by the time that Tut was born. One thing we talked about is how beautiful the jewelry and artifacts look in photographs but when you see them in person, they look so cheap. Granted they were made in 1332 BCE and earlier . . . they didn't really have all the tools we do now to make jewlery. Though the intricate details in the death masks and heiroglyphics on the coffins and other artifacts are incredibly beautiful. 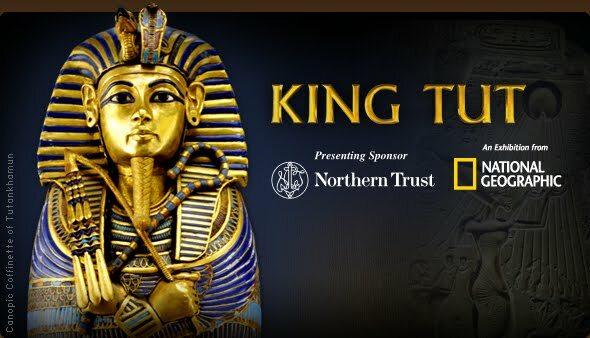 Apparently Egypt won't let the mummy of tut or his death mask travel because they are too precious/fragile, so as great as all the artifacts are, if you actually wanna see this young king, you are going to have to go to Egypt. Oh and doesn't King Tut kind of look like Michael Jackson? Weeeiiirrrdddd.